English Puritans from Massachusetts were drawn to this area by the lush salt meadows which were ideal for raising cattle. Long before the arrival of the English in 1638, Native Americans, mostly the Pennacooks, had used the area as their summer camping place. They fished in the river and planted corn and beans in the rich upland meadows. After the harvest, when winter drew near, they moved inland to spend the winter hunting. Numerous artifacts found near the Taylor River are silent witnesses to their long occupation of what became the fourth English settlement in New Hampshire. The Pennacook tribe were members of the Wabenaki Confederacy. They were fishers and hunter-gatherers who inhabited New Hampshire and parts of Maine, Massachusetts and Vermont. Their numbers diminished due to the diseases brought by the French and English colonists and by wars. By the end of Queen Anne’s War (1702-1713), the Pennacook had largely been absorbed into the Abenaki. The Pennacook tribe spoke in the Algonquian language family and were members of the Wabenaki Confederacy. The name Pennacook comes from the Abenaki word ‘penakuk’ meaning “at the bottom of the hill.” The people are also referred to as the Merrimack and the Pawtucket. The Pennacook tribe were primarily fishers, farmers and hunter gatherers. The Pennacook mainly lived in wigwams made of birchbark but as inter-tribal warfare increased they also lived in fortified villages of longhouses. The 1600’s saw the French establish New France and the English settled in the present-day US states of Maine, Vermont, New Hampshire and Massachusetts encroaching on Pennacook lands. The Europeans brought terrible diseases such as typhus, smallpox, measles, influenza and diphtheria and a series of epidemics killed nearly 75% of the Pennacook people. The French and Indian Wars (1688-1763) raged for 75 years as France and England fought for the new lands in North America. The Pennacook become allies of the French. 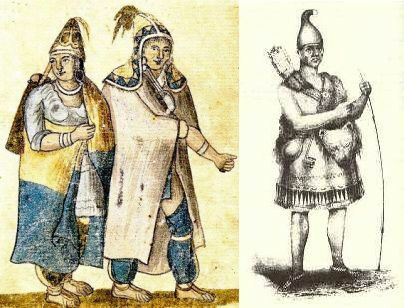 The French defeat in the wars and inter-tribal warfare resulted in the dispersal of the remaining Pennacook people who, by the end of Queen Anne’s War (1702-1713), had been largely absorbed into the Abenaki who relocated to Canada. The descendants of the Pennacook tribe live among the Abenaki at St. Francis and Wollinak (Becancour) in Quebec. 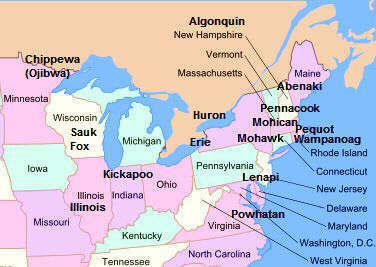 Other Pennacook descendents are based in Manchester, New Hampshire and in Franklin, Massachusetts. The Pennacook are people of the Northeast Woodland Native American cultural group. The location of their tribal homelands are shown on the map. The geography of the region in which they lived dictated the lifestyle and culture of the Pennacook tribe who primarily inhabited the Merrimack River valley. The picture shows Chief Passaconaway and the clothes worn by Pennacook Native Indians. During the hot summer the Pennacook men wore a breech cloth tucked over a belt that hung to mid-thigh from the back with fringed leggings that tapered towards the ankle. Moccasins were made with a long tongue and a high collar that could be left up or folded down. Snowshoes were also worn during the winter. 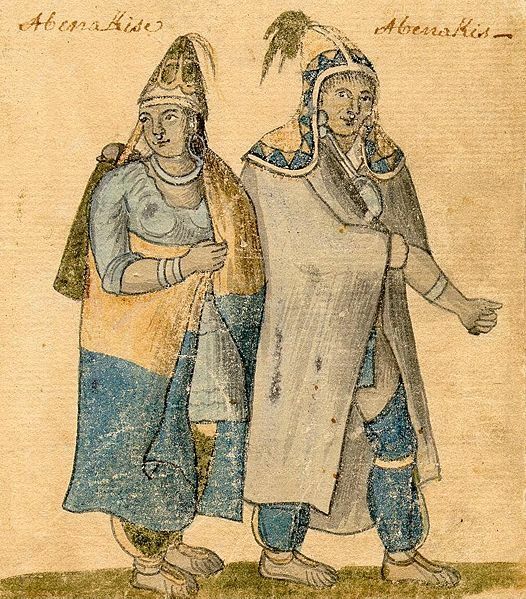 The Pennacook women wore deerskin wrap-around skirts, poncho style and also wore leggings. In the winter cloaks or mantles were worn by both men and women. The Pennacook also wore highly distinctive, pointed or peaked hoods made from birch bark or leather that covered the shoulder were elaborately decorated with feathers at the point. The Pennacook tribe lived in Wigwams, also known as Birchbark houses – see the above picture. These shelters were domed shaped or pyramid shaped wigwams. A Wigwam was built using wooden frames that were covered with woven mats, sheets of Birchbark and animal skins. Ropes were wrapped around the wigwams to hold the birch bark covering in place. As time passed the Pennacook started to build oval-shaped Longhouses in fortified longhouse villages surrounded by fencing to afford defense from hostile tribes. The food that the Pennacook tribe ate included their crops of corn, beans and squash. Fish such as sturgeon, pike, salmon and trout were caught. Hunters provided meat from deer (venison), bear, moose and smaller game like squirrels and rabbits. Duck, grouse and wild turkey also added to the variety of their food. Their food also included vegetables, mushrooms, nuts and fruits (cherries, blueberries, plums, strawberries and raspberries). The Pennacook Native Americans built canoes made from the bark of the birch trees over a wooden frame. The lightweight Birch Bark canoes were broad enough to float in shallow streams, strong enough to shoot dangerous rapids, and light enough for one man to easily carry a canoe on his back. The weapons used by the Pennacook included tomahawks, battle hammers, war clubs, knives, bows and arrows, spears and axes. A New Wave of Prominent African-American Retirees is Enriching and Changing Our City. A welcome wave of African-American retirees is making its mark on our city. On a chilly Saturday night last February, the valets at The Ritz-Carlton, Sarasota were scurrying around as usual, parking the long line of shiny Lexus, Mercedes and BMW lined up for yet another black-tie gala. What wasn’t so usual was the crowd. More than 500 guests were arriving for the inaugural fund raiser for the Sarasota chapter of the black fraternity Gamma Xi Boule’, and about half of them were African-American. That’s an unfamiliar sight in Sarasota County, where 5 percent of the population is black (the national average is 13 percent) and only a smattering of African-Americans appears at most high-profile events. But it wasn’t just the range of skin colors that felt novel. Many of the African-Americans in the ballroom were recent newcomers, part of an influx of retired black professionals who are beginning to make a mark on their new hometown. The newcomers include college professors and administrators, doctors, corporate executives, ambassadors, politicians and journalists. They’ve lived in major cities, mainly in the North and Midwest, and enjoyed impressive careers that have taken them all over the country and world. They come with wealth, talent, experience and connections. Among their ranks are Emmy- and Peabody Award-winning journalist Charlayne Hunter-Gault and her husband, Ronald, a retired banker; James A. Joseph, former ambassador to South Africa and his wife, Emmy Award-winning television journalist Mary Braxton-Joseph; former Detroit Mayor Dennis Archer and his wife, retired Michigan District Court Judge Trudy DunCombe Archer; Donald Reaves, a director of Amica Mutual Insurance and formerly the CFO of Brown University and the University of Chicago; Robert Wood, a past CEO of Chemtura (formerly Dow) Corporation and now a board member of the U.S. Olympic Committee; and retired Harvard Business School professor James Cash Jr., who has had board positions with Microsoft and Wal-Mart and is a member of the Boston Celtics ownership group. Why are they coming? Most say that’s simple: It’s for the same reasons other successful people retire to Sarasota. Sarasota County’s black population grew by 3.5 percent from 2010 to 2014, while the county’s overall population grew by 2.9 percent. Many of these black newcomers, like many white newcomers, are retirees—all part of the massive wave of baby boomers across the country who are now retiring, and in many cases, moving south. 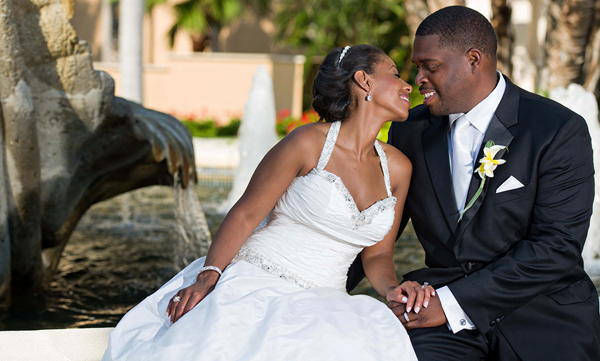 But their relocation to Sarasota is not only part of the baby boomer demographic shift; it’s part of a larger pattern of African-American migration in the United States. Starting in the 1970s as just a trickle, black people began to move out of the Northern and Midwestern cities where they’d fled decades ago in hopes of finding a better life. That first exodus, between 1915 and 1970, saw 6 million African-Americans pack up and head North to avoid the poverty, violence and Jim Crow laws of the South. That movement is often called the Great Migration, something journalist Isabel Wilkerson, who spoke in Sarasota in 2015, chronicled in her Pulitzer Prize-winning book, The Warmth of Other Suns. Now those Northern cities and states are losing African-Americans of all ages, from young professionals to retirees, to the Sunbelt. For young and working people, no matter what their color, economic opportunity is the major attraction. The South is growing and prospering while many Northern and Midwestern states are losing population and jobs. But the South also holds emotional ties for many African-Americans. They have family and memories in places where the tea is sweet and the air is soft and languid. In their retirement years, African-Americans often want to go back to those roots. As demographer William Frey documents in his 2015 book, Diversity Explosion: How New Racial Demographics Are Remaking America, this latest African-American migration—called the “reverse migration”—will change the United States politically, culturally and economically. “It’s a large, broad-based movement that’s been going on for a long time and it’s come into its own,” he said from his office at the Brookings Institution in Washington, D.C.
Bernard and Lois Watson moved here from Philadelphia, where he was a well-known educator and philanthropic leader. Retired educator Lois Watson moved to Sarasota from Philadelphia in 2002 with her husband, Bernard, now 87, who is well known in cultural circles for relocating—some say saving—the legendary art collection of Philadelphia’s Barnes Foundation when he chaired the foundation’s board. (See “The Remarkable Doctor Watson” in our Platinum 2015 issue.) Lois Watson remembers when a friend, Sarasota orthopedic surgeon Randall Morgan, told her to consider retiring here. Even before the current wave of African-American baby boomers, some black retirees found their way to Sarasota. And back in the 1980s, one of the main reasons they came was a dynamic black real estate agent, the late Alice Peggy Hairston. Her former friends and clients say she was known as the Pied Piper for her ability to lure prominent out-of-state African-Americans to Sarasota. Many people Hairston brought here knew each other from their summer homes in Sag Harbor in the Hamptons and Martha’s Vineyard, says Taylor. That’s still true today. 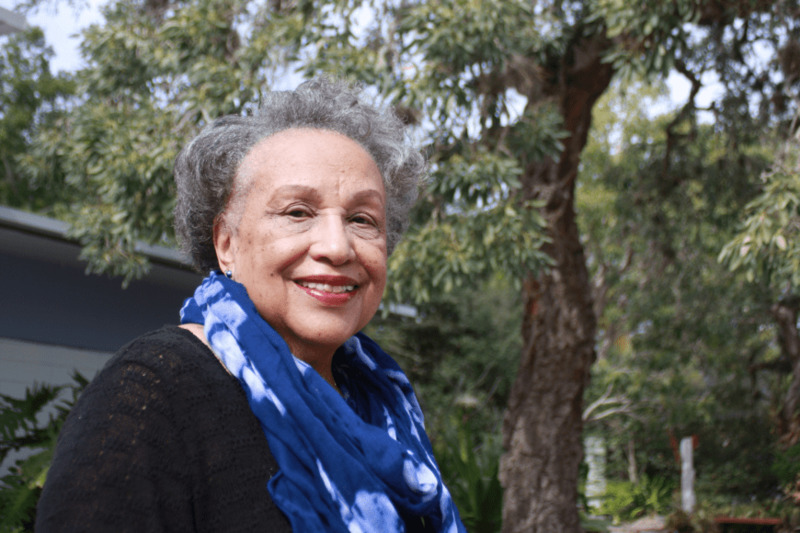 Journalist Charlayne Hunter-Gault, 74, who bought a home in Sarasota in 2013, says she and her husband often run into people they know from Martha’s Vineyard, where they spend their summers. (The town of Oak Bluffs on the Vineyard has long been a vacation retreat for wealthy black people.) “We call Sarasota Martha’s Vineyard South,” jokes Hunter-Gault, who says she and her husband enjoy the town’s arts and restaurants (they own a vineyard in South Africa). She also has spoken at events for nonprofits such as New College and the Community Foundation of Sarasota County. James Taylor, now president of Boule and a financial planner, came to Sarasota in 1982, but he wasn’t a retiree lured here by realtor Hairston. Instead, he was something rarer in those days—a young African-American banker from Ohio who came here to work for Barnett Bank. “When I went into a restaurant every head turned as if no one had seen a black person walk into a restaurant before,” he recalls. Still, he adds, “I’ve never had anyone approach me antagonistically or offend me because of race issues since I moved here,” and he says he felt like he belonged from the beginning. 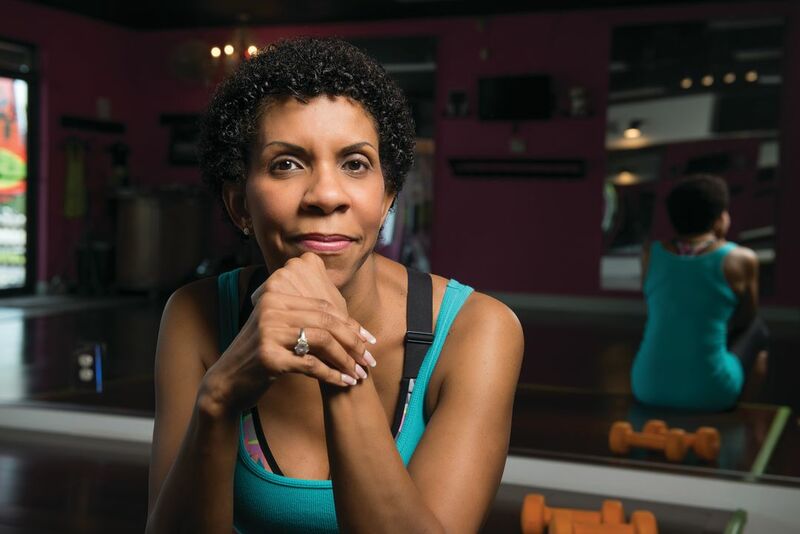 Like many other new retirees, Michelle Davis decided to start a business–Zumba Sarasota–after she moved here from New Jersey. Many of the African-Americans retiring to Sarasota today are pioneers, the vanguard of their race to move out of poverty and away from centuries of enforced segregation. They were often the first in their families to go to college, to become professionals and to achieve upward mobility. It took courage and determination. Hunter-Gault, for example, faced enormous hostility as the first of two African-Americans students to enroll at the University of Georgia in 1961. Mark Jackson, a 68-year-old retired strategic marketing director for global business customers for AT&T (later Lucent Technologies), remembers interviewing at New Jersey Bell Telephone when he was a college student and initially being offered a job as janitor rather than on a professional track. His wife, Penny, started out as an AT&T operator before becoming international data offers director for Lucent and traveling all over the world. Bernard Watson was one of the few black students in the 1960s at the University of Chicago, where he received his Ph.D. As an undergraduate at Indiana University, he was threatened with a gun for advocating for racial equality, an incident that only strengthened his commitment to civil rights activism. He went on to a distinguished career as an educator and college administrator and was appointed by three presidents—Lyndon Johnson, Jimmy Carter and Bill Clinton—to serve on various councils. Many of the African-American professionals who retire here are also connected by their membership in black fraternities and sororities, and organizations, such as The Links, an African-American-only service organization for women. 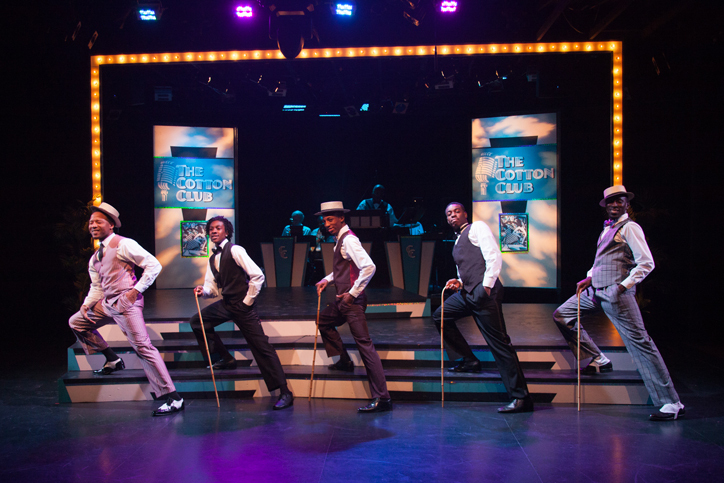 Boule, which held the gala at the Ritz-Carlton, is an invitation-only black fraternity for high-achieving men. These groups play enormously important roles in the lives and careers of black professionals. “You have to understand our history,” says Bernard Watson. Decades ago, black people were barred from joining many organizations, which limited their opportunities to network, get involved in civic affairs or socialize. They couldn’t meet in most restaurants or reserve or rent most public or private space for meetings. Black-only groups provided support, networking and a wide circle of friends who understood each other’s aspirations and obstacles. “When you traveled you couldn’t go to hotels, so we stayed at each other’s homes,” Bernard Watson remembers. 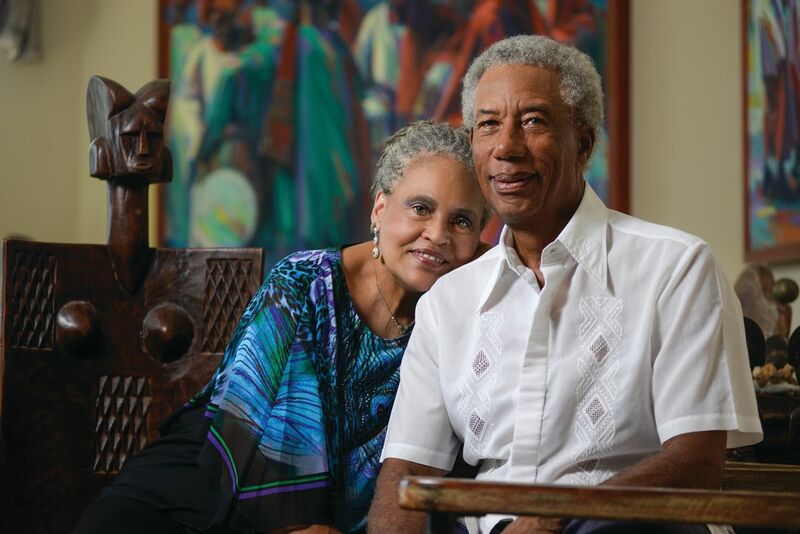 ASALH—the Association for the Study of African American Life & History—is often the first meeting place for new African-American professionals and retirees in Sarasota. The local chapter, Manasota ASALH, Inc., which just celebrated its 20th anniversary, is the largest of the 27 chapters in the nation, with 187 members. It’s bigger than chapters in Chicago, Atlanta and Detroit. Former AT&T exec Jackson, the current president, says that five years ago they had only about 50 members. “Everyone who comes here passes through ASALH. We’re growing exponentially,” he says. Because of its clout and numbers, the chapter brings in big national speakers for its annual dinner. In 2015 it was author Wilkerson. This year it was historian and ASALH’s national president, Evelyn Higginbotham. Two of the attendees were Dr. Valerie Montgomery Rice, the dean of Morehouse School of Medicine in Atlanta, and United States ambassador to the United Nations and former Congressman Andrew Young Jr., who were traveling the country to raise money for the medical college. When Rice, whose son attends Ringling College of Art and Design, spoke at a fund-raising gathering at Florida Studio Theatre that weekend, she told the 200 prosperous-looking African-Americans in the crowd that she had no idea there were so many of them in Sarasota. These newcomers have settled all over Sarasota, at the Ritz-Carlton, in Lakewood Ranch, University Park County Club, The Oaks and everywhere in between. But they haven’t chosen to live in Newtown, the historically black and poor neighborhood in Sarasota. Tensions exist between the two communities—the black old-timers who have lived for generations in a segregated neighborhood and the new black bourgeoisie who have lived, worked and mixed socially with whites for their entire careers in major urban centers. Like other retirees, new African-Americans can take time to get their footing in the community and find where their passions and talents will lead them. Some—like legions of other baby boomers—are starting new businesses that reflect their personal interests and passions. Michelle Davis had been a fitness trainer up in New Jersey. After her husband died, she partnered with another woman to start Zumba Sarasota, a dance and fitness studio. Others have plunged into local causes and organizations. Carol Buchanan, a former educational administrator from New York, moved here 23 years ago with her late husband, Carroll. Now 87, she started the Gulf Coast Community Choir and sits on the boards of Florida Studio Theatre, Planned Parenthood of Southwest and Central Florida and Westcoast Black Theatre Troupe. Michele Redwine, an artist and educational consultant from New York, moved here in 2005 with her late husband, Preston, an executive at I.B.M. She immediately found places where her expertise would be useful, including Art Center Sarasota, Gloria Musicae and Realize Bradenton. Today she serves on the board of the Hermitage Artist Retreat and the Ringling Museum. Both women have made it a mission to attract the newer African-American transplants onto boards and into the community. “I’d love to get more of these folks involved,” says Redwine. Chief Twelfth Judicial Circuit Judge Charles Williams, who has been an important voice in race relations in Sarasota, says the arts community is feeling the effects of these newcomers. “It used to be that they were here only three months; now more of them are full-time. They’re having an impact. 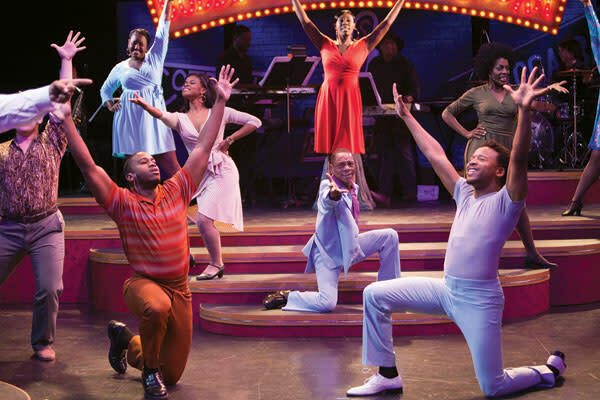 All of a sudden, [we’re seing more] plays dealing with race and diversity. And these new people are donors. They go to the ballet, the theater,” he says. Regardless of how much they may choose to get involved, these newcomers, by their very presence—on our tennis courts and golf links, in restaurants, supermarkets and on the beach, in political meetings and at charity fund raisers—are already making Sarasota a more diverse and interesting place. “Beauty sleep“ is the deep sleep you need to feel healthy, function properly and look bright and attractive. Young people do not get enough sleep. Although this is no surprise to any of us, it is a serious problem associated with risky behaviors. 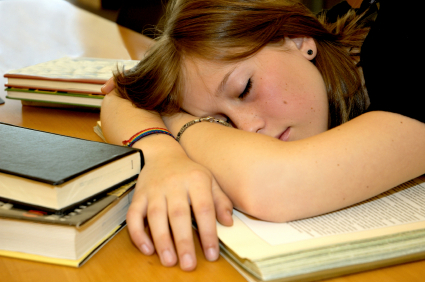 70 % of high school students are not getting the recommended hours of sleep. Even worse, this age group is least likely to believe that lack of sleep can cause all kinds of physical and psychological problems. Fatigue, alcohol abuse, hazardous driving, smoking, fighting, lack of physical activity and acting out sexually are all side effects. Add to that feelings of being sad or hopeless and even having suicidal thoughts. Visible signs of sleeplessness such as dark circles and dull skin are obvious, but there is more damage below the surface. Sleep affects the way we look, our bodies release growth hormones that are released at the beginning and in deep stages of sleep. These hormones are the ones that produce beautifying effects on our skin. This growth hormone aids in the stimulation of skin cell production, collagen formation and decrease protein breakdown. In other words, it is the surge of growth hormones that stimulates skin repair during the night. These hormones are only released during deep sleep, when the body and brain are able to fully recover from the day’s activities. Young people are always fighting acne and other skin blemish problems, however we may be missing the real cure for complexion woes: sleep. The idea of “beauty sleep” isn’t new, but it has become harder to achieve as current sleep disruptors such as laptops, the web, video games, emails, facebook and smartphones follow us to our bedrooms. The effects are real: A 2010 study published in the British Medical Journal found that people who had a full night of sleep (8 hours or more) compared with sleep ­deprived individuals, were rated by observers as healthier and less tired (obviously), but was also seen as more attractive. Does sleep guarantee perfect skin? Not exactly. However, since the skin is highly reactant to products applied right before bed, your nightly skincare regimen can be the extra boost to a flawless complexion. When we skimp on sleep, our bodies can’t release the growth hormone, but it does release more of the stress hormone (from adrenal gland) “Cortisol.” An abundance of stress hormones can increase inflammation and break down collagen leading to lines, wrinkles and increased acne formation. Sensitive skin may also be a symptom of lack of sleep. Depriving yourself of adequate sleep affects the skin’s natural barrier function which can lead to dryness, irritation and increased skin sensitivity. When this happens the epidermis (outer layer of skin) cannot protect itself from chemicals and pollutants in the environment. Creativity, ingenuity, confidence, leadership, decision-making; all of these can be enhanced simply by getting more sleep. stopthstupidity Create a free website or blog at WordPress.com.